Students in the Valenti School of Communication are learning the FAA guidelines necessary to operate drones. 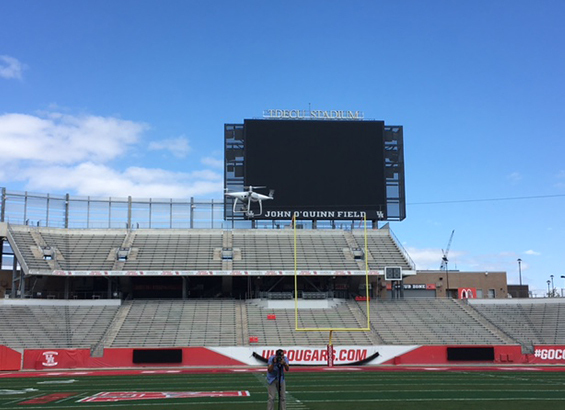 As the number of people buying Unmanned Aircraft Systems, more commonly known as drones, increases, the University of Houston is giving students a “high-flying” lesson in how to operate them. The three-week course at the UH Jack J. Valenti School of Communication covers different drone applications, Federal Aviation Administration (FAA) guidelines and basic flight operation, as well as giving students hands-on flight training. According to the FAA, more than 750,000 people in the United States had registered a drone as of early March. That number is expected to reach 7 million by 2020. “It used to be very expensive to get aerial photography – you had to use a helicopter. Now you can use drones, which are less expensive, safer in a lot of ways and easier to use. So for all of our students, it’s a really important skill to have,” Northup said. Once students complete the class, they can take the FAA licensing test for unmanned aircraft. Media Production senior Sean Arnold believes having a license to fly a drone will make him more marketable. The class is currently available to UH students and Northup hopes to offer training to the public in the future.